The Blues were toothless in their efforts against Arsenal, prompting a post-match outburst from their manager. 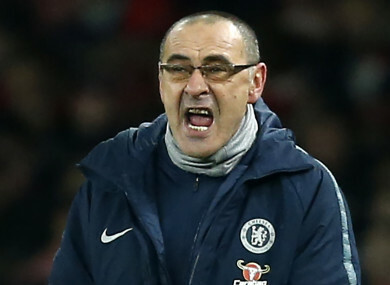 MAURIZIO SARRI HAS slammed his Chelsea players following their 2-0 derby defeat to Arsenal, stating that that his players are “very difficult to motivate”. Chelsea’s backline started frantically at the Emirates, conceding possession on numerous occasions before they were made to pay by Alexandre Lacazette’s fine finish from a tight angle. A little bit of luck went the Gunners’ way for their second, a lofted cross going in off Laurent Koscielny’s shoulder as he attempted to head home. “I have to say that I’m extremely angry because this defeat was down to mentality,” Sarri told the press. I think when you see this type of game where one team is more determined then you can’t talk about tactics. Their level of determination was much better than ours throughout the game. Pushed further on why he can’t get through to his squad, he said: “That’s a difficult question to answer. It seems that they’re not aggressive enough mentally – that’s down to their personalities and that’s difficult to change. I don’t think a player at this level can be afraid to face up to their responsibilities. The best thing that can happen is that the players and I speak very openly. Despite Saturday’s loss, Chelsea remain three points ahead of Arsenal in fourth place and must now prepare for an FA Cup clash with Tottenham on Thursday. Email “'Maybe they shouldn't be playing at this level' - Sarri eviscerates 'mentally weak' Chelsea players”. Feedback on “'Maybe they shouldn't be playing at this level' - Sarri eviscerates 'mentally weak' Chelsea players”.